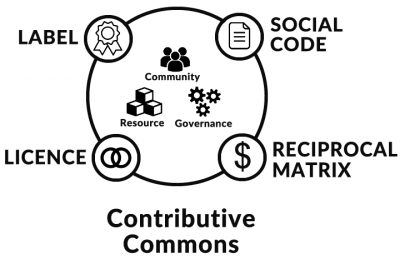 The site Contributive Commons comes from a first article of analysis and reflection about reciprocity licenses (such as Peer Production License) wrote by Maïa Dereva. This article is very long (15 pages), so the site displays short fact sheets to synthesize the key ideas of this proposal. After analyzing the reciprocity licensing proposals and previous studies on the subject, the conclusion seems to be that a reciprocity license alone can't reflect all of the necessary conditions for the regulation of commercial transactions given that they are authorized for commons. In particular, it seems a compromise to draft consensus terms since they are based on moral values. The license defines the general conditions of access and diffusion, but it withdraws the conditions of commercial use in a different document called a "social code". A Reciprocity Matrix: equivalent to a rate schedule that clearly indicates contributors' conditions of payments depending on the use made of the common. This matrix is in the social code. A money : unencrypted and abundant, it is just to clarify the interaction between the labeled commons. 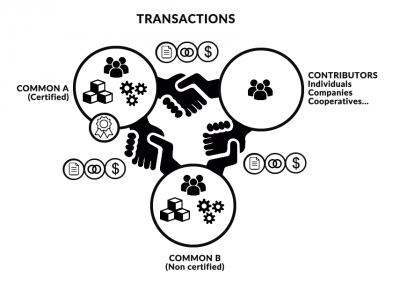 A contributor (individual, company, cooperative, common ...) does not necessarily have the label, but shall accept in full knowledge the terms of the transaction proposed by the common. 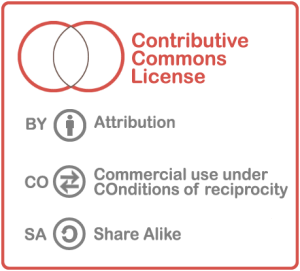 Commercial use under conditions — You are permitted to make commercial use of this work, all or part of the hardware if you meet the criteria of a "contributor" in the Social Code of the common covered by this license, and if you settle the possible fee contributory mentioned in the reciprocal matrix indicated in this Social Code. This page was last modified on 13 March 2019, at 16:42.